Our program heavily emphasizes good sportsmanship and teamwork. At least once per week, we include a team building activity or some sort of character building discussion surrounding the topic of sportsmanship. 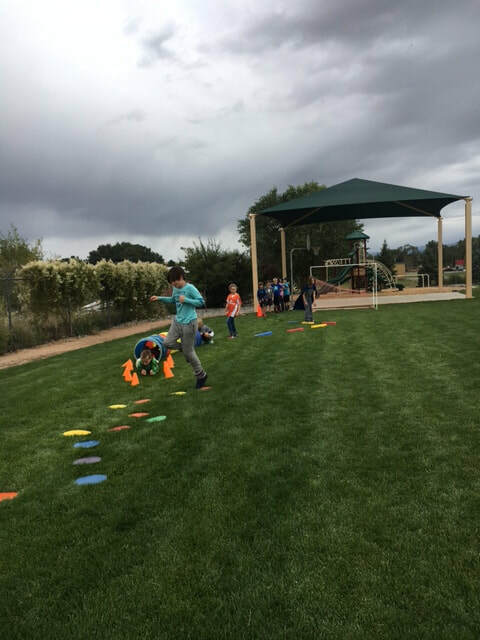 Things like building obstacle courses, crossing over challenges, communication activities along with open discussion about these topics are ways we integrate this into the culture of our PE program. We have a great opportunity at MASLOW to create a full nutrition, wellness and cooking curriculum. 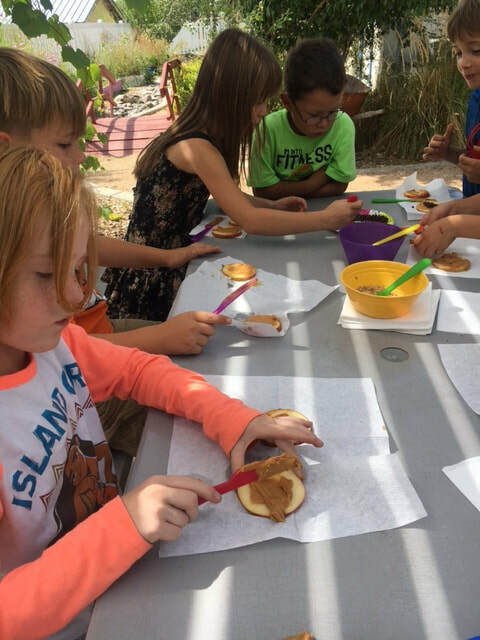 As the year progresses, please check back on this site for information about topics we are discussing and recipes we are creating in our class. Make sure you check back regularly below to see any updated posts! We both feel passionately about health, nutrition and fitness. We love spending our days with your children and look forward to a great year! This week ,to celebrate Halloween, we used a juicer to make "Vampire Juice". This juice was made from Apples, carrots, cucumber and beet to give it the red flavor. ​All of the kids tried the juice, even those who were trepidacious. Most of them really enjoyed the juice and asked for seconds! Way to go Maslow kids! If you are interested in something for your kids to do with their Halloween candy, rather than eat it. I suggested the children look on Youtube for videos of Halloween candy science. There are many ways to melt, dissolve and play with the candy rather than eat all of that sugar! Here are a couple links if you are interested. Ask your child to show you how to properly execute a squat or a press. We have been working hard on these foundational movements. In addition to squats and presses we have been able to get some time on the pull up bars. I am so proud of the progress the children are making. Most of intermediate class can successfully perform a pull up. Many kids in primary can as well, however height is an issue for some of them so we have to practice using our arms on lower bars for now. This is for sure, these kids work hard! 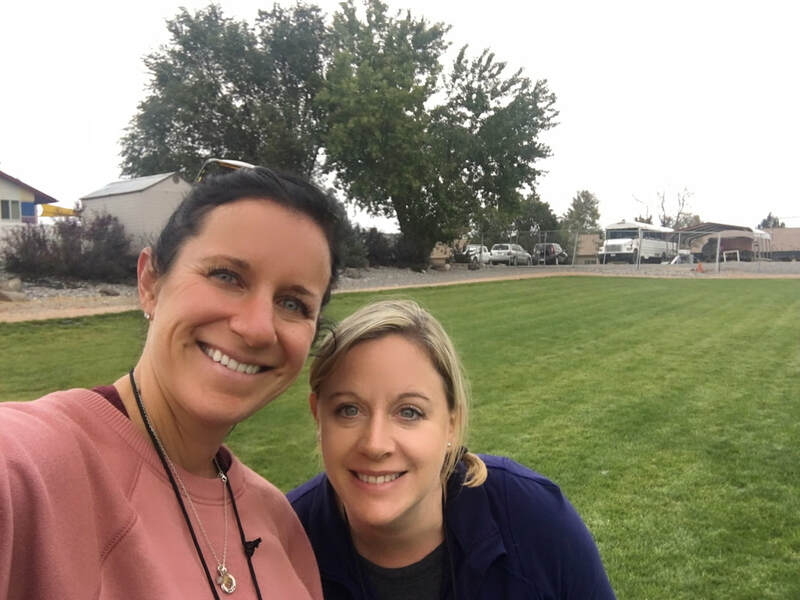 This fall weather has been amazing and allowing us to have outdoor PE consistently! We have introduced several new games and have spent the first month of school beginning to learn and review movement standards for many of the excercises we repeatedly do in our program (squat, press, push up, burpee, pull up, toes to bar etc.). This has been a great review for many of the students that are familiar with our program and a way to introduce these movements to new students. We are excited to be offering our first mass shirt sale! This will be a great way for students to get spirit gear that they could wear for spirit days. The sale will end November 10th so make sure you get all of your orders in before then. A few parents had questions about sizing. Below is a link to the fancloth size chart for reference. 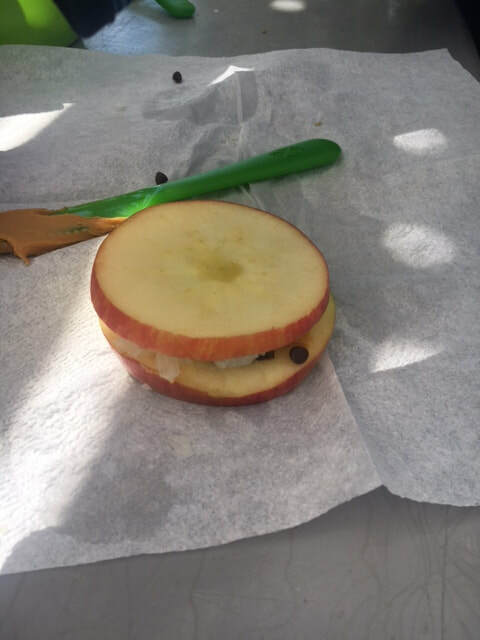 This week we made apple "sandwiches". This is a great afterschool snack that the children can make with very little assistance. -Apple cut into flat slices to make the "bread"
-Smear of some sort- We used Wowbutter to avoid nut allergens. You could use any sort of nut butter at home if you wish. 3. Top smear with you choice of topping. 4. Places the slices back together to create a sandwich. The children loved this activity. I hope some of our child friendly snack options allow your children some autonomy in the kitchen. Giving kids ownership of the food they are eating is a great way to help them start making healthy choices on their own.